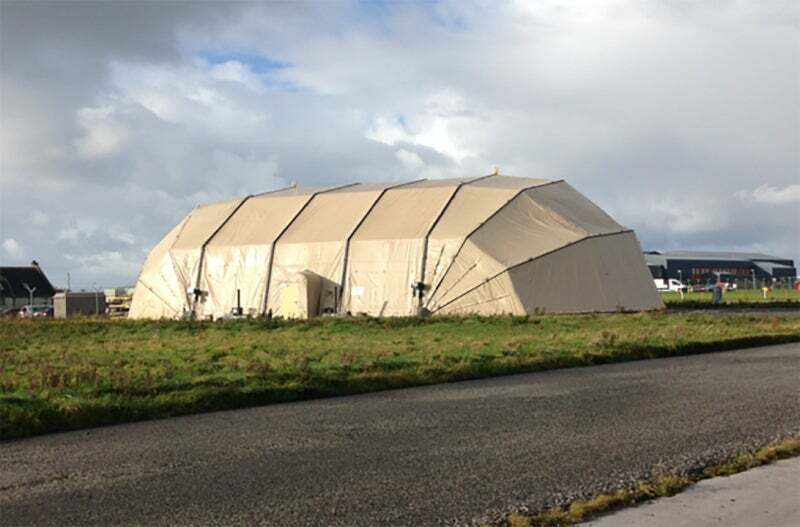 The Ministry of Defence (MoD) Operational Infrastructure Programme (OIP) Team manages and supports Technical Working Environment (TWE) to ensure temporary hangars can be deployed and built at short notice in inhospitable environments. TWE enables the MoD to deploy temporary hangars in support of operations, exercises or trials at short notice without the manpower and cost requirements of a permanent ‘wet build’ (bricks and mortar building) solution. The current capability means a huge hangar can be erected on average between four and seven days (wind dependent) and can accommodate all in-service fast jets, rotary wing aircraft and Unmanned Arial Vehicles (UAVs). The team played a key role in supporting the Unmanned Warrior event at Benbecular, Scotland, by installing a 20m Rubb EFASS deployable aircraft hangar (RES) at the site. This type of beautiful but barren environment is exactly the type of challenge that the TWE capability is designed to overcome. Breathtaking views, calm waters and glorious sunshine can be replaced at a moment’s notice by driving rain, gale force wind and almost zero visibility. While the temperature outside can be as high as 50°C or as low as -20°C, those inside are kept at a comfortable internal ambient temperature of 20°C. Jo Llewellyn, head of the infrastructure team in OIP explained: "Its primary purpose is to provide an environmentally controlled, safe working space for aircraft, enabling personnel to carry out missions that are considerably more challenging outside of permanent infrastructure. One key item within the TWE capability suite is the 20-metre span Rapid Environmental Shelter (20m RES) – a versatile shelter designed for use in the most austere and varied environments, from freezing conditions to the searing heat of the desert. "A recent study by the RAF at Conningsby concluded that the use of a RES increased aircraft serviceability by 20% when compared with aircraft stored outside in the elements. This delivers a marked increase in the number of sorties that can subsequently be staged while on operations." She added: "Navy Command identified quickly that Unmanned Warrior (a maritime autonomous systems demonstration of the coast of Scotland) would need a TWE capability due to the rugged and hostile environment on the island of Benbecula. The purpose of Unmanned Warrior was to demonstrate the latest unmanned system technologies, including air, surface and sub-surface vehicles and sensors." The team set about making arrangements to ensure a Rubb 20m EFASS (RES) could be deployed and erected in time for the hugely successful event. Jo commented: "Over a period of three months, 523 Specialist Team Royal Engineers (STRE), part of 20 Works Group Air Support, conducted recces and drew up the logistic plans. The project team from OIP, along with a team from 5001 Sqn, who are the only suitably qualified and experienced person (SQEP) constructors and maintainers for TWE, arrived and the erection of the shelter progressed. "By attending the build, the infrastructure team were able to discuss any issues face to face with the user, capture and address areas of continuous improvement, gain an understanding of the ongoing challenges that 5001Sqn face with the products and discuss the most up-to-date construction methods used in other inhospitable locations where TWE is deployed around the globe. "This particular mission ably demonstrated the tri-service nature of the capability and the cooperation between the different organisations involved." TWE, a Tri Service capability, is sponsored by the army, while the tasking authority is Permanent Joint Headquarters (PJHQ). Initial site surveys for TWE projects are carried out by 20 Works Group Royal Engineers and RAF 5001 Squadron. Finally, the asset is constructed and maintained by 5001 Sqn. The Rubb Military team will be highlighting all the latest product developments and project news at Stand S4-165, UK Pavilion, South Hall 4, DSEI 2017, ExCeL, London, from 12-15 September. For more information please visit www.rubbmilitary.com.